Critical thinking is a higher-order cognitive skill that is indispensable to students, readying them to respond to a variety of complex problems that are sure to arise in their personal and professional lives. The cognitive skills at the foundation of critical thinking are analysis, interpretation, evaluation, explanation, inference, and self-regulation. Below is an image that represents each of these skills (Facione, 2010, Critical thinking: What it is and why it counts). To create environments that engage students in these processes, instructors need to ask questions, encourage the expression of diverse opinions, and involve students in a variety of hands-on activities that force them to be involved in their learning. Instructors should select activities based on the level of thinking they want students to do and the learning objectives for the course or assignment. The chart below describes questions to ask in order to show that students can demonstrate different levels of critical thinking. What do we already know about…? How does … tie in with what we learned before? What is the counterargument for..? What are the implications of…? What is the best..and why? What do you think causes..? Why? What is another way to look at? Online instructors can use technology tools to create activities that help students develop both lower-level and higher-level critical thinking skills. Reflection activities. Reflection activities provide students with opportunities to track their learning and demonstrate their progress throughout the semester. To enhance the level of critical thinking students do through reflective activities, tell students to cite course materials that have helped them advance their knowledge and thinking. Example: Use Google Doc, a collaboration feature in Canvas, and tell students to keep a journal in which they reflect on what they are learning, describe the progress they are making in the class, and cite course materials that have been most relevant to their progress. Students can share the Google Doc with you, and instructors can comment on their work. Peer review activities. Peer review activities enable students to demonstrate communication skills by giving feedback on each other’s work, expose students to alternative perspectives, and allow students to question what they are reading. Doing peer review activities online can protects students’ anonymity, making students more likely to be honest in their feedback (Lin, S. S., Liu, E. Z. F., & Yuan, S. M., 2001, Web‐based peer assessment: feedback for students with various thinking‐styles). Example: Use the peer review assignment feature in Canvas and manually or automatically form peer review groups. These groups can be anonymous or display students’ names. Tell students to give feedback to two of their peers on the first draft of a research paper. Use the rubric feature in Canvas to create a rubric for students to use. Show students the rubric along with the assignment instructions so that students know what they will be evaluated on and how to evaluate their peers. Discussion forums. Discussion forums allow students to communicate with their peers, answer questions that require them to demonstrate both lower-level and higher-level critical thinking skills, and analyze course content. When instructors set clear guidelines for participation and model critical thinking skills through their participation in discussion forums, students can also demonstrate how they are engaging in the critical thinking process. Example: Use the discussions feature in Canvas and tell students to have a debate about a video they watched. Pose the debate questions in the discussion forum, and give students instructions to take a side of the debate and cite course readings to support their arguments. Small group activities. Small group activities allow students to communicate, problem solve, hear different perspectives, and collaborate to analyze and synthesize course content. By assigning small group activities, instructors can engage students in multiple levels of critical thinking. Example: Use goreact, a tool for creating and commenting on online presentations, and tell students to design a presentation that summarizes and raises questions about a reading. Tell students to comment on the strengths and weaknesses of the author’s argument. Students can post the links to their goreact presentations in a discussion forum or an assignment using the insert link feature in Canvas. Digital Storytelling Activities. Telling digital stories allows students to use multimedia (images, audio, video) to present information. Digital stories can include 1) personal narratives, 2) stories that document events, and 3) stories that inform and instruct. Creating digital stories allows students to evaluate, reflect on, or analyze course content (Robin, 2006, Digital storytelling: A powerful technology tool for the 21st century classroom). Example: Use goreact, a narrated Powerpoint, or a Google Doc and instruct students to tell a story that informs readers and listeners about how the course content they are learning is useful in their professional lives. In the story, tell students to offer specific examples of readings and class activities that they are finding most relevant to their professional work. Links to the goreact presentation and Google doc can be submitted via a discussion forum or an assignment in Canvas. The Powerpoint file can be submitted via a discussion or submitted in an assignment. Critical thinking is an invaluable skill that students need to be successful in their professional and personal lives. Instructors can be thoughtful and purposeful about creating learning objectives that promote lower and higher-level critical thinking skills, and about using technology to implement activities that support these learning objectives. 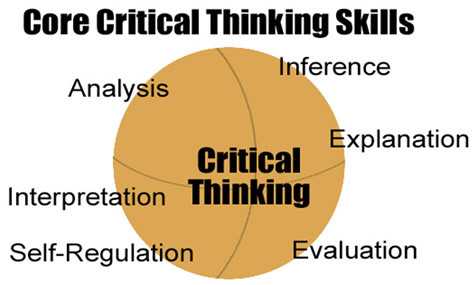 Below are some additional resources about critical thinking. Carmichael, E., & Farrell, H. (2012). Evaluation of the Effectiveness of Online Resources in Developing Student Critical Thinking: Review of Literature and Case Study of a Critical Thinking Online Site. Journal of University Teaching and Learning Practice, 9(1), 4. Lai, E. R. (2011). Critical thinking: A literature review. Pearson’s Research Reports, 6, 40-41. Lynch, C. L., & Wolcott, S. K. (2001). Helping your students develop critical thinking skills (IDEA Paper# 37. In Manhattan, KS: The IDEA Center. Mandernach, B. J. (2006). Thinking critically about critical thinking: Integrating online tools to Promote Critical Thinking. Insight: A collection of faculty scholarship, 1, 41-50. Brilliant post. Will be sharing this on our Twitter (@refthinking). I would love to chat to you about our tool, the Thinking Kit. It has been specifically designed to help students develop critical thinking skills whilst they also learn about the topics they ‘need’ to. Excellent share! Can I know few tools which help in developing critical thinking skills to students? Any help will be appreciated. Thanks! Thanks for sharing the article. Is there any way to find tools which help in developing critical thinking skills to students?